‘By 2070, the bulk of the world's population growth is predicted to take place in Africa: of the additional 2.4 billion people projected between 2015 and 2050, 1.3 billion will be added in Africa, 0.9 billion in Asia and only 0.2 billion in the rest of the world’. What would be the effects of such explosive growth? One would like to be an optimist and hope that through a concerted effort of the developed world and African governments supported by modern technology (greening of the Sahara?) the growing population could be fed and sheltered without wars, deforestation, wiping out wildlife, an increase in greenhouse gases emission. However, looking at the present situation the room for optimism is rather limited. There are tribal conflicts, religious conflicts, and many of the continent's government are corrupt. The dominant religions and cultures are essentially opposed to family planning. The unchecked increase in Africa's is a ticking environmental time bomb that should be at the top of the world's agenda but surprisingly is seldom discussed. As of 2016, the total population of Africa is estimated at 1.225 billion, representing 17% of the world's population. According to UN estimates, the population of Africa may reach 2.5 billion by 2050 (about 26% of the world's total) and nearly 4.5 billion by 2100 (about 40% of the world's total). The majority of humans have little to no climate footprint, rather than the unconstrained growth of people, the more important category of analysis for climate impact is the unconstrained growth of production and consumption. The world can support many more crofters than rich consumers in capitalist economies. Don't worry about population. Mother Nature has the requisite ways and means to lower the population to sustainable levels. Just hope you're not around when she does it. We also have the means. Educate women. Give them opportunities to contribute creatively other than childbirth. 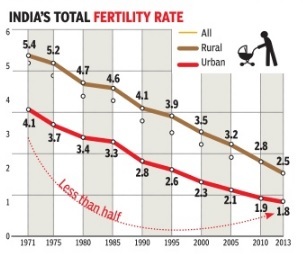 Population growth stagnates. It's not hypothetical. It's called Europe. Projections of population growth may not be realized. Global warming is likely to have significant effects on food production, disease rates, available water for drinking and agriculture (and industry), reproduction, and so on. Worse for everyone concerned, 2070 will be another 50 years past peak oil. The whole world will be very hungry for that dense energy source. The greening of the Sahara, never mind stopping the progression of desertification on the southern edge of the Sahara, is not something we will be able to engineer. Are you familiar with the "wet bulb" measurement? It references how fast moisture evaporates at given temperatures and humidity. Human beings can not survive outside when the wet bulb temperature is above 98. [>98º + high humidity] Why? Because our sweat doesn't evaporate, we can't cool off, and our internal temperature starts to rise, and we go into heat shock and die. A high wet bulb temperature means that much less time outdoors is available for agricultural work, hence less food production. Who will be affected? Everyone in tropical and sub-tropical areas, including the southern US. Yes; affluent people reproduce less than poor people. Why, exactly, isn't clear. Maybe affluent people are too busy earning affluent incomes to raise children. Maybe affluent people would rather be affluent than spending hundreds of thousands of euros on children. Maybe child survival rates are so high that 1 child is enough. Maybe sophisticated European metrosexuals just can't be bothered. Europe's population rate is below replacement levels which is a good thing in terms of ZPG, but is very bad for the economy. After all, somebody has to work in the factories, distribution centers, transportation, hospitals, nursing homes, farms, etc. Therefore, immigrant labor is necessary. Fortunately for affluent people in Europe, North America and parts of Asia there are plenty of inexpensive laborers available. I'm not knocking immigration here (I do that elsewhere). I'm just pointing out that the virtue of low birth rates here and there is limited, because the population of laborers is still needed by affluent people to maintain affluence. Yes. That has been demonstrated many times that educated women bear fewer children. Population growth was a big bogaboo in the 1970's. Now it isn't. Only African countries might be worried. The thing is that likely in this Century we will see Peak Human population and then the global population will shrink. Already a lot of countries are decreasing in population. The biggest reason for this is the rise of prosperity: we simply don't need offspring to take care of us anymore. And as Bitter Crank said, women are educated, their role isn't to produce as much offspring as they can as before. It is clear enough. Poorer people need children to provide for them, and generally speaking child mortality has been, until recently, relatively high in many places (as you mentioned). Of course religious attitudes, medicine, education pay into this too, other than the need for an extra pair of hands to bring the money in (call it the natural pension scheme if you will; cynical view but it’s the practical truth in many places around the globe). 2, What would be the effect on its environment and greenhouse emissions. Immigration is definitely not a solution to a problem of this scale even if it was not fiercely resisted by the hosting countries, It is worth noting that infant mortality nowadays even on the poorest African countries is less than 10%, so fertility of 5-6 children is not justified on grounds of being looked after in old age. I wish I could be as optimistic as you are. China has basically made a real short term pension problem into the future. Climate change deniers as flat-landers. Is climate change overblown? What about the positives?